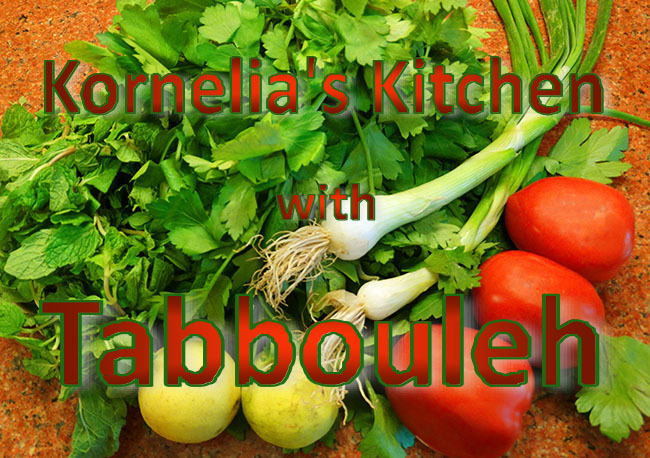 I start my new blog with a super healthy recipe: Tabbouleh. This dish comes from the Middle East where it is one of the most common salads. In recent years, Tabbouleh has conquered the world with other Mediterranean delights like hummus, Baba Ganoush and falafel. During this voyage it has seen many transformations, similar to pizza that exists now in versions that have little to do with the original. I like to prepare Tabbouleh in a way that resembles the original. That means my main ingredient is flat leaf parsley, followed by mint. You take about double the amount of parsley to mint. What I use sparingly (though more than in the Middle East) is the wheat. 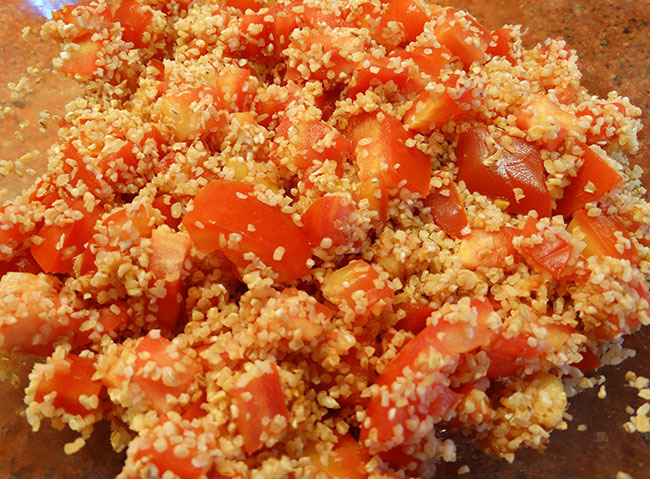 For the original Tabbouleh Lebanese and Syrian housewives use bulgur wheat. Although you can find this in India, where we live, it is quite expensive and not as fresh as the local cracked wheat that is called daliya. 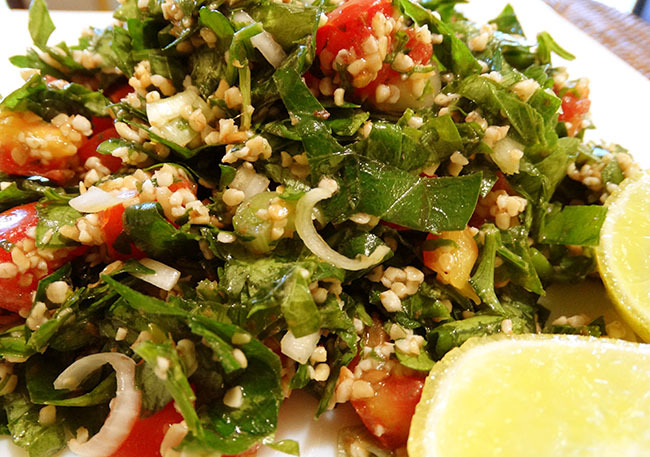 In some western countries Tabbouleh has morphed into a salad whose main ingredient is bulgur. Although this can make quite a pleasant meal, it has little to do with the original. The seasoning of the salad differs widely. Please use anything you fancy. I like it with plenty of black pepper and Zatar powder, but people also add cinnamon or other spice mixtures. Tabbouleh makes an excellent side dish for meat or fish. The downside of this dish is that you have to eat it preferably on the same day it is made. It is not a salad, which you can keep in the fridge for any length of time. I actually like Tabbouleh as a main course with a bit of bread and a piece of cheese. It makes a perfect light lunch on a hot day. Wash the tomatoes and dice them. Place them into a bowl and add the daliya. Some people recommend soaking the wheat in hot water, but I don’t think that is necessary. The moisture from the tomatoes and the herbs is enough to soften the cracked wheat when you let the tabbouleh sit for a bit before serving it. If you want to serve the salad immediately, you might want to mix the wheat with three tablespoons hot water. Wash the herbs and drain them. Pluck the parsley leaves from the stems and cut them. You should not use the food processor for this job because it is damaging the structure of the leaves too much. 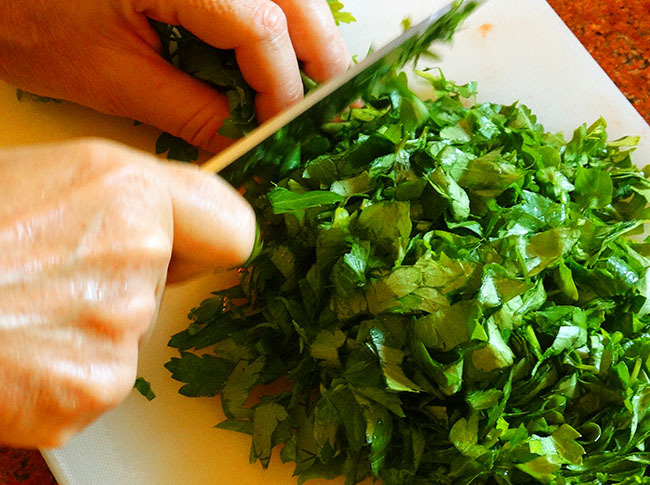 For tabbouleh you have to cut the parsley by hand with a sharp knife. Take a handful of leaves, bundle them with one hand and cut them as finely as possible. Do the same with the mint leaves. 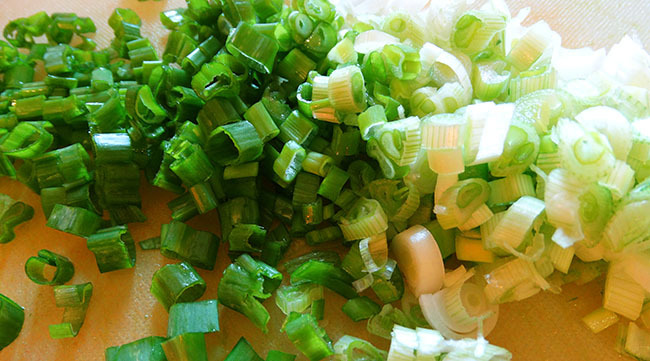 Wash and clean the spring onions and slice them finely. Add them to the bowl. Squeeze the lime over the salad; add the olive oil and season with salt, pepper and other spices. I like Zatar powder because it adds a bit of zest to the salad. Zatar is made from ground thyme, salt, sumac and sesame seeds. 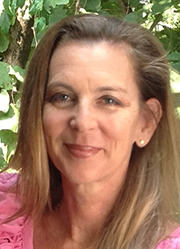 Congratulations on your first Blog !! Thank you, please spread the word.